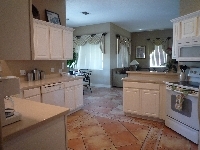 The large, spacious 3,300 sq. ft. Villa with private fully screened pool, sleeps 12 and has been furnished to the highest standard. It is FULLY ALARMED for your security and peace of mind. It can comfortably accommodate families vacationing together or those who simply wish to enjoy a little more space and luxury in beautiful landscaped surroundings. It is the perfect location from which to visit all the major theme parks and tourist attractions and is also only a few minutes drive to restaurants and supermarkets. The Disney attractions are an easy 15 minutes drive away and SeaWorld, Aquatica and Universal are approximately 20 minutes away. In approximately one hour you can drive to the Atlantic ocean or the beautiful beaches of the Gulf of Mexico. Within an hour's drive of Orlando there are more than 150 superb golf courses. Ten minutes drive away is Champions Gate International and National 18 hole courses, both designed by Greg Norman. 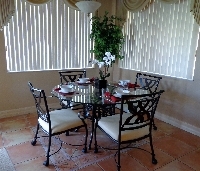 The villa is furnished and maintained to a high standard. 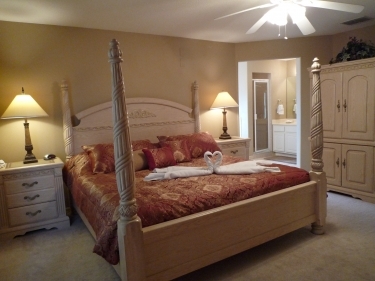 It has 2 master ensuite bedrooms, (1 King, 1 Queen) each with walk-in shower, jacuzzi bath and double washbasins. There are 2 further junior ensuites bedrooms and 2 twin bedded rooms. 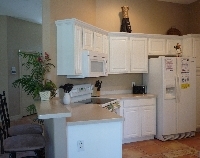 On the ground floor is a fully equipped kitchen with corian countertops, American style fridge/freezer, oven, microwave and dishwasher, not to mention coffee maker, toaster etc. 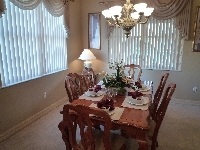 There is a breakfast nook, as well as a more formal dining room as well as 2 bar stools for a quick breakfast. A comfortable family room with 55"TV, DVD player and stereo is the perfect place to relax after the hustle and bustle of the theme parks or, alternatively, relax in the peaceful living room with a good book, or simply to watch a different choice of programme. You will also find a good sized downstairs bathroom and shower, again with double washbasins and also a separate laundry room with washing machine and tumble dryer. Outside is a fully screened pool/spa. 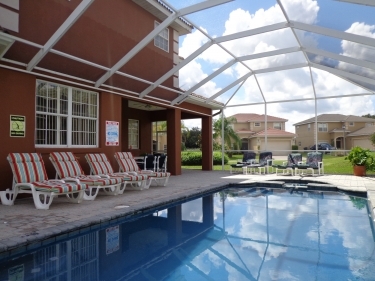 The brick paved pool deck and covered lanai are the perfect place for outdoor meals and there are table and chairs, as well as sun loungers for relaxing by the pool and enjoying the Florida sunshine. 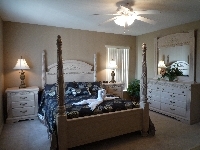 There is a 55" TV in the family room and TVs in the living room and all the bedrooms, DVD players and stereo/hi-fi. Free Wi-Fi is available. 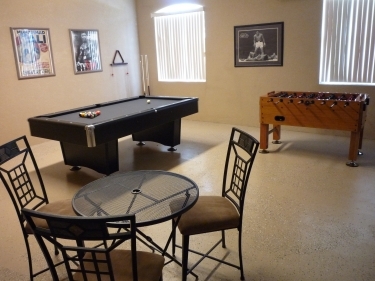 All linen, towels and pool towels are provided free of charge. A crib/bedding and high chair are also provided FREE OF CHARGE. Rate for Christmas 2018/19 £1,575 + £100 end of stay cleaning fee.